The Lacuna is meant to be a living sculpture of books. The Bay Area Book Festival is June 6–7 around Downtown Berkeley. Visit BayBookFest.org or ProjectLacuna.com to learn more. The wonder of reading is impossible to define and incredibly difficult to capture. It's that feeling that comes from getting lost in a book — from looking up and realizing that you were totally immersed in its pages. A book festival may never quite replicate that magical moment, but that is what a group of volunteers will attempt at the inaugural Bay Area Book Festival in Berkeley this June. 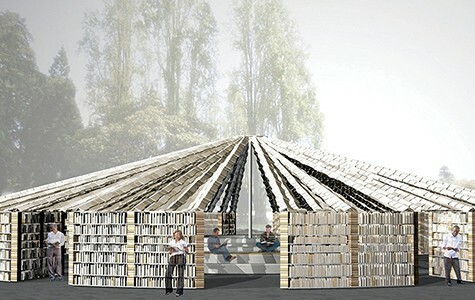 They plan to install Lacuna, an outdoor reading temple made of 50,000 free books that visitors can slowly dismantle throughout the festival, by taking books out of the walls and bringing them home. The idea started with the Internet Archive, a nonprofit digital library containing millions of free books, movies, software, music, and more. The archive receives donations of free books from all over the world, which it scans. For each book that it stores online, the Archive also keeps a physical copy, but it also receives hundreds of thousands of duplicates that it doesn't need. So when Archive director Brewster Kahle heard about the Bay Area Book Festival, he asked festival founder Cherilyn Parsons if they would be interested in giving away books to attendees for free. Of course, the answer was yes. But how? Kahle and the festival organizers didn't want to leave the books in a huge pile at the center of the festivities. Victoria Rojas, a project manager by profession, volunteered to help out with the festival and wound up in charge of the project. For the past two years, Rojas and a group of friends have been bringing the Black Rock Public Library to Burning Man. 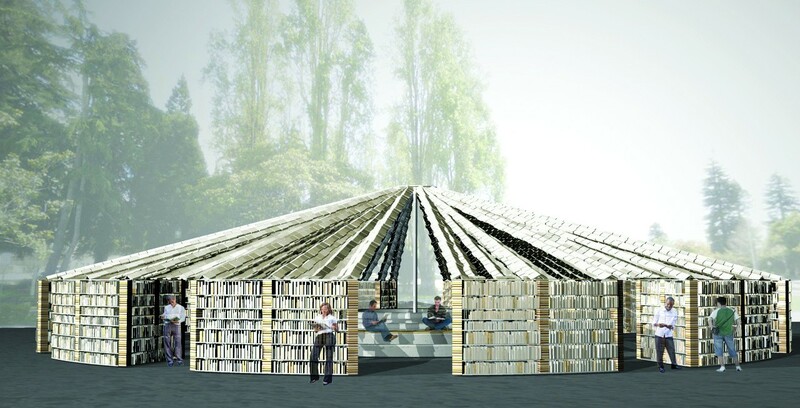 Boasting one hundred books the first year, and three hundred books last year, the group creates a pop-up library in the middle of the desert — complete with a cozy atmosphere and a "screwy" decimal system. For a project of this scale, Rojas brought on the Flux Foundation, an artist collective famous for building the Temple of Flux, which was a massive Burning Man centerpiece in 2010. Rojas came to the collective with the idea of building a temple-like structure with up to 200,000 books, and the design for Lacuna was born. The core of Lacuna will consist of pillars made from stacks of unwanted books — such as out-of-date SAT prep guides — solidified with resin. Those pillars will be positioned into clusters of four, and connected by thin wooden shelves to form twelve alcoves in which readers can read. The alcoves will form a ring around the old fountain in the middle of Martin Luther King, Jr. Civic Center Park in Berkeley, the center of the Bay Area Book Festival. Guide wires will run from the ground through each pillar and to a pole at the center of the fountain, forming a tent-like structure. Those wires will then be covered with individual book pages, to create a shady, fluttering roof above the seating inside. Of course, every shelf will be packed with books — 50,000 of them — that visitors can pluck from and read there, or take home. Lacuna is as much about the books as it is about the book-shaped gaps that will be left behind. It's meant to be a living sculpture, involving each person who interacts with it. Every time someone takes a book, a sliver of light will enter the alcoves, changing the way that the installation looks and feels. "It's not just like we built something, and you look at it and marvel at it," said Rojas in an interview. "It's like you are an act in constructing and deconstructing it, or making it come to life." While the project has the useful goal of disseminating free books, the other goal is to foster a joy of reading and to draw people to the festival with spectacle. The Bay Area Book Festival has been especially cognizant of reaching out to communities outside of Berkeley — to people who might not typically get excited about something like a book festival. Rojas hopes the installation will draw in a wide range of audiences, especially kids who aren't already excited about reading. Rojas and her co-organizer, Melinda Noack, are both volunteers, and they have about fifty volunteers helping them (as well as a whole bunch from the Flux side), but they still need money for materials. They've received a few grants that cover the majority of the costs, but need $10,000 more to meet their budget. For that purpose, they started a Kickstarter campaign. At the time of this writing, the campaign needed approximately $2,000 to reach its goal by April 23. In the meantime, Rojas, Noack, and the other volunteers have been busy sorting books into genres so that Lacuna contains a curated collection of titles that people will actually want to take home. Noack and others are also planning a series of events to get people excited about the project. The first will be a zine panel (featuring V. Vale and others) at Rock Paper Scissors on April 16, at which they plan to build a small-scale version of Lacuna out of the zine archive at the collective. It also includes a reading at the newly opened Octopus Literary Salon (2102 Webster St., Oakland) on April 26, and a "chain-reaction" event at E.M. Wolfman on May 6, which will feature a series of readings in which each is inspired by the last. If all works out, Lacuna won't just be limited to the festival, but will have many reincarnations at other festivals, museums, and libraries. Because of the design, it's easy to re-install and adjust to various sites. "This project is so fantastic and clearly not just glued to the festival. It can take on a different meaning depending on the location it goes to, which is really awesome," said Noack. "There's no reason why Lacuna has to be unique to the Bay Area," added Rojas. "It's something every book festival could have.